Strongway Hose Reel Parallel or Perpendicular is well designed using quality materials. It has an attractive look and s easy to use. Its performance and quality finish have made customers using it, to recommend it and provide positive reviews. It is easy to use, and you have the option of setting for either right or left­hand operation. Strongway Parallel or Perpendicular Wall-Mount Model makes the winding and unwinding of the hose very easy. It is durable and does not leak or break easily. The model also has a warranty against leakage and breakage. It is top in the market and with high demand. Here are some of the great features according to our taste and performance that make Strongway Wall Mount Hose Reel unbeatable in the market. The Strongway Wall Mount Model is superbly engineered using quality materials. The superb skills applied in the construction of the model, make it be a high­quality system with the beautiful performance. This garden hose reel is made using Aluminum alloy and Brass Swivel. The aluminum cast is thick and acts a rust­proof material. The hardware is made using stainless steel, while is fitted with brass swivel to allow maximum water flow. Its handle is made using a thick synthetic material and aluminum bracket, to ensure its firm and comfortable. The stainless steel shaft makes rewinding much easier. Finally, it has a clutch which you can use to lock and unlock using a lever, to keep the reel from spinning when not in use. Pulling off the hose becomes a breeze when the clutch is opened. The Strongway Model has a ten­year warranty against leakage, corrosion, and damage. Aluminum and steel used in construction ensure it does not rust. The fittings of the made using brass, which ensures no leakage of even a single drop of water. The hose reel can last for many years before it breaks since the materials used are hard and where synthetic material is used, cast aluminum is used to cover it. This Strongway Wall Mount Garden Hose Reel is sturdy and precise. The documentation on the fitting and assemblage of the hose reel is accurate. The longest time you can take in the installation of the hose reel is 15 minutes. It has an easy installation process, and its kit comes with screws for mounting it on studs, together with a set of masonry anchors. These make its assembling and installation much easier. It features mounting hardware, which allows you to mount it either parallel or perpendicular. The Strongway has a high capacity of 150’. The high capacity holds 5/8” by 150’ hose correctly. Also, it allows you to wind and unwind the hose quickly. Its sturdy design ensures the hose is not pinched. Quality materials: the device is made of quality materials which make it reliable. High performance. Easy to use. Does not leak: the fittings of the device are done perfectly, making it leak­proof. Durable: the materials employed in the construction of the device are reliable, making it last for long without breaking. Sturdy design: it well built, making it withstand even cold weather during winter. Easy to mount: the device features mounting hardware, and comes mounting screws, making easy to mount either parallel or perpendicular to the wall. The materials used in the construction of the device makes it very expensive. To use the device, you mount it on the wall, otherwise reeling becomes very difficult. Q. Could this be carried from the front yard to backyard? I don’t have a good place to attach it to the front of the house? A. You mean back and forth? Portable? No. It is very heavy and solid. Q. Does it leak over time Period? A. It is all steel fittings so the chances of leaking are low. Q. Does this reel come with the connector hose to go from the reel to the sprocket? Q. How much 5/8″ Rubber hose this reel can really hold, Realistically? A. It works very well. Strongway offers an extender which would accommodate more. Strongway Hose Reel Parallel or Perpendicular is a device engineered using high technology, making perfect. It is easy to assemble and mount. The materials utilized in the making of the instrument are active, making durable as it cannot easily break. It does not leak due to the quality fitting. In addition, its rust­proof, due to the materials used. 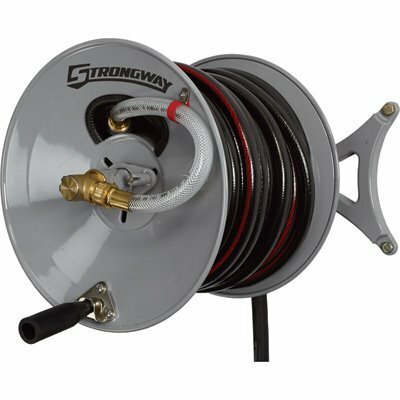 If you are in need of a durable and reliable garden hose reel, Strongway hose reel is the best fit. You do not need to keep moving it up and down after mounting on the wall.